Heard someone suggest Screwball last night and I just happened to find this bittersweet picture of her tonight for the occasion. Hope she gets her dream one day. Time for the news guys! Check it after the break. This lovely piece was the center piece of the art gallery at BUCK and now it can be yours according to BUCK officials! For BUCK 2013, we had a My Little Pony: Friendship is Magic oil painting commissioned, which stood as the centrepiece of our art gallery, in our main foyer. This is a beautiful 3' x 4' oil painting in a proper gilt frame, by an artist who has produced designs for the British Royal Family; collectible potteries like Wedgwood and Spode; as well as the Sheikhs of Arabia, and many of the luxury hotels across the middle east. The artwork has been created as a personal favour, and has taken nearly 9 months to produce. It is called "Equestria at War" by John Eastley. 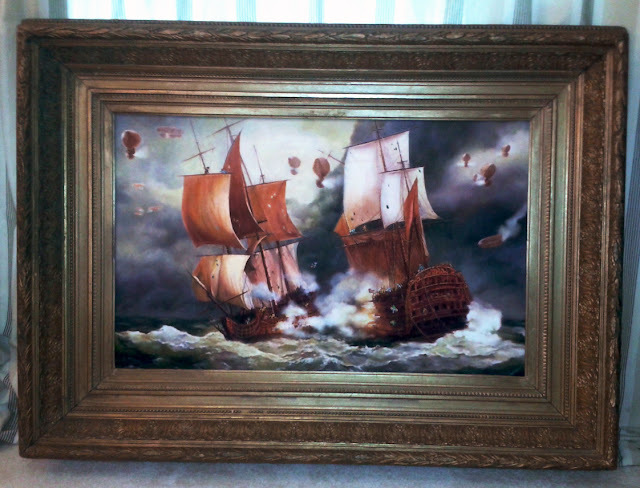 We are now looking to sell the painting to anyone who may be interested in this unique piece. We can courier it to any worldwide location (prices on request - this is a heavy piece); and the purchaser may have it mounted or unmounted (i.e. the frame removed, to save on weight). Offers should start around £2,000 GBP unmounted; or £2,500 GBP mounted. 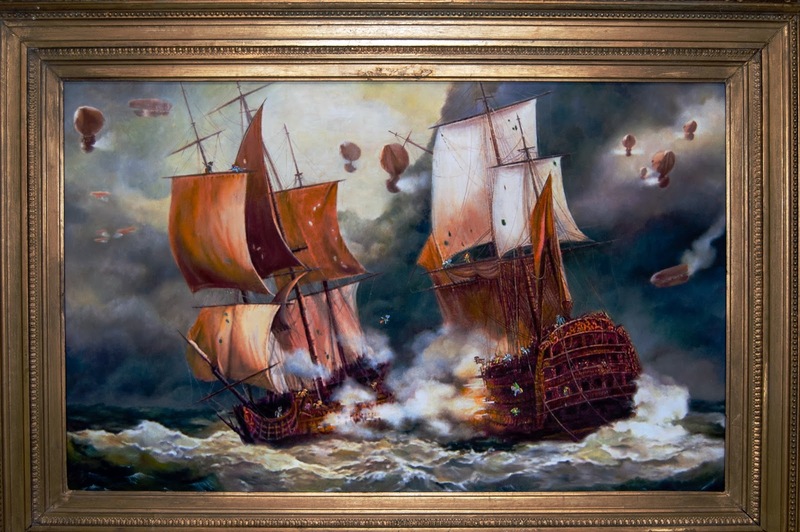 You will not see a painting like this again; and its estimated cost to purchase from a professional gallery would be well in excess of £15,000 to £20,000 GBP. Attached are two pictures, one showing the full frame, and another hi-resolution picture, showing the detail. Furthermore, the artist has agreed that once purchased he is willing to amend the ponies on the artwork, so if the purchaser wished to include specific OCs, then that would be included in the price. Please note that there will be a delay of roughly 10-12 weeks before shipping as the canvas is prepared for transport. I hope that we can find someone who will appreciate this once-in-a-lifetime opportunity. Love the creativity with this one! Been wanting to update the wallpaper on your Android? Look no further! I have updated the Live Wallpaper, it now includes ALL the ponies that are available in Desktop Ponies, instead of just the mane6. You can turn individual ponies On or Off. without needing to update the application. I guess that will come in handy if season 4 will include some new ponies. Not only has the wallpaper app been updated, but the blind bag guide for Androids has been updated as well. Rejoice! I have updated the Brony MLP Blind Bag Guide app for Android. It is now possible to mark your progress, using checkboxes. Just the check the ponies that you have to fill the progressbar. We (Fluffikens and me) have made sure that when a new Wave (9) arrives we can quickly add it to the app. This fits in perfectly with our AJ Appreciation Day event we have going on. Plus, it has been a long day, at least for me, so napping seems like a good idea. New Pony Header for Stores? 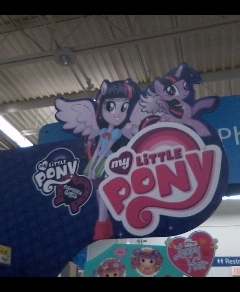 Someone visiting a local Wal-Mart saw that the header around the MLP aisle has been changed to this new format. What do you guys think of it? Looks pretty cool to me. After a few posts here on the Roundup awhile back, the MLP Text Game project has made some cool progress they would like to share with you all tonight! The above gif is a demonstration of some of the things they have come up with, but a detailed explanation can be found at the link below. Best of luck to them as they constantly improve on this text adventure! 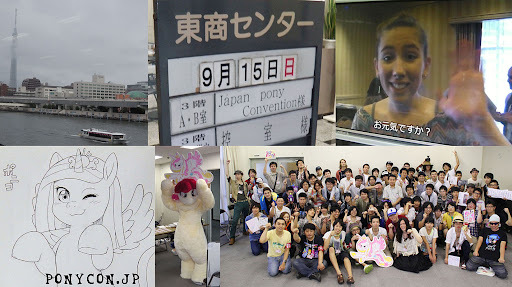 the first-ever Japanese MLP fan convention. whose name was announced at the con. fans, which were recorded at Fiesta Equestria back in June. 6, other is among every MLP characters, and Applejack won the both polls! will be held on January 5, 2014 at Kawasaki City. 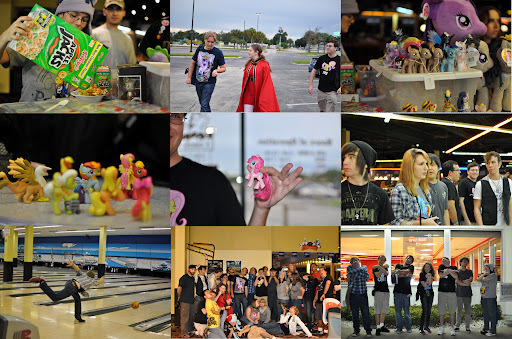 The Central Florida Bronies had a long acronym title bowling meetup take two of ~25 guests at Boardwalk Bowl in Orlando on September 16, 2013. It was followed by Steak n' Shake again because Denny's had closed for the night. Thanks to everypony that came. Croatian Japanese pop culture community is organizing PandaKon 2013 convention on 27th of October in Močvara club in Zagreb. Lot of bronies will be there as well. Meeting time for us can be one hour before the con, which would be 11am in front of Močvara club. Entrance to the con is free. My friends and I have been wanting to make an MLP series for a very long time. I have ideas for episodes, OCs have voice actors and concept art, some jokes are already written for the show, and other things are done. But, none of us have flash. I've used the trial, and I cant figure anything out. So, as you have probably figures out by now, we need animators. You will be given credit for your. This IS NONPROFIT, it is only for fun. I recently heard the tale of a pony fan injured in a fire accident that left him with burns on his body. If you can, send him some words of encouragement at [email protected] Below is the message and image I received. "My family had a bunch of boxes in a fireplace down near our old camper and my mom wanted me to burn them sinse we have more boxes, I went down there with a lighter and my iPod, when I was getting near the burn pit I was about to see if we had any fire starters, and my friend dosed gasoline on there when I wasn't looking, when I got out of the garage I noticed the wood was wet but the boxes weren't, I had a stuffed nose at the time so I couldn't smell anything, when I set it it erupted, burning my kneecaps, arm and my face." I ask of you all.... if there is anything you guys can do to help my friend out, I'd be eternity grateful. Hi this is the director for the new animated movie called Fallout Equestria and I,am looking for female voice actors. PS. Try outs are happening on October 14th up to October 28th. 2011 - A season 1 interview with Lauren Faust, the top ten pony vids of August, Facebook MLP teasers continue, and an Equestria Online demo are highlights of today. 2012 - Gravity Falls intro is ponified and EqD opens a Minecraft server. New Rainbow Dash in M.U.G.E.N.